Archive for the ‘Puzzles’ Category. The correct answer is B). The correct answer is A). John Conway came to the 2017 MOVES conference and told me that he wanted to talk to me about subprime fibs. The subprime Fibonacci sequence was invented by John Conway, and I wrote a paper about it. The paper, Conway’s Subprime Fibonacci Sequences, wasn’t written with John, but rather with Richard Guy and Julian Salazar, and is published in Mathematics Magazine. I wanted to visit my friend Julia, who lives in Princeton, and this was a good opportunity to discuss the mysteries of subprime fibs with John. On my second day in Princeton, I came to the math department around 3:00 pm carrying some apples. John never goes out for lunch, as he has trouble walking, so he is always hungry by the end of his work day. Thus, each time I go visit him, I come with food. We have very different tastes in apples: unlike me, he likes his apples unwashed. Anyway, by the time I arrived to the department, John had already left. This was somewhat unusual, so I called him. He sounded weird and not very coherent, as if he wasn’t feeling well. Considering also that he had left early, I started to worry. Unfortunately, there was a lot of background noise during our conversation and I only understood that he was at a pizza place. John walks very slowly, so he couldn’t have gone too far away from campus. I found him in the second pizza place I checked. It was Tiger’s Pizza. He told me that he felt very sleepy and tired. However, I was gratified to see how much having an interested listener gave him energy. He started telling me stories of his trip to Germany a long time ago. He had already eaten, but decided to have some more fries. As a perfect gentleman he offered me some, but I didn’t want any. At some point he dropped a couple of fries on the floor. He tried to reach them and I jumped to help. That was a mistake. I actually know that he likes proving to me and to himself that he can do stuff independently. He accepts my help when I am subtle about it, or when it is unavoidable. Anyway, he looked at me angrily and I backed off. He picked up his fries from the floor and ate them. I liked his T-shirt and tried to take a picture of it. As you can see, I am no photographer. 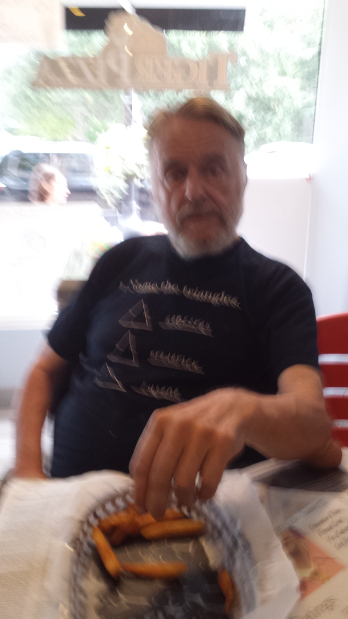 The T-shirt shows a test question: Name the triangles. Then it features three triangles: an equilateral, isosceles, and right. It also provides someone’s answers to this naming test: Geoffrey, Frederick, Eugene. John asked me if I am more scared of Donald Trump or Kim Jong Un. We agreed that Trump is scarier. At this time he seemed his usual self. I offered John a ride home, as I do whenever I visit him. He was very glad as he felt very tired. He started to get up. This time, I remembered not to try to help. He couldn’t get up, I waited. He tried to push his weight off the table top, but the table was wobbly. I leaned on the table, as if to rest. We often play this sort of game in which he welcomes my help as long as we both pretend that I’m not helping. My car was a block away and he wanted to walk the block. But after making two steps out of the pizzeria he changed his mind and asked me to bring the car to him. This was the first time ever. This visit he was so much worse than ever before. John’s puzzle. Given a Mebius strip with a hole, how do you embed it in 3-D so that the two circular borders of the surface are equivalent? I dropped him off at his house and offered to walk him to the door. He refused. I sat in my car and watched him walking very slowly along his path. I had this sinking feeling in my gut that I was seeing John for the last time. I drove away, once he disappeared behind his door. On my way back to Boston I visited my friend Vitaly in East Brunswick, and the next day my high school friend Olga in Edison. In Edison, my car started beeping and I panicked. I was far away from home, and didn’t want to be stuck in NJ. I started to look for the source of the sound. It was John’s phone. As always, my gut feeling deceived me: I had to go back to Princeton. I drove back to John’s apartment. His door was unlocked and I entered. He was resting in bed. He was greatly annoyed at being disturbed. I explained the reason, and gave him his phone. He took the phone and said, “Off you go.” I had this sinking feeling in my gut that these words would be the last words that I would hear from John. This is a math blog, but from time to time, I write about other things. Today I have something to say about puns, which I adore. I also like gym, but rarely go there: it doesn’t work out. I stopped using stairs, because they are up to something. I wanted to learn how to juggle, but I don’t have the balls to do it. I work at MIT, the work place with the best dam mascot: Tim the Beaver. My salary is not big, and I stopped saving money after I lost interest. I’m no photographer, but I have pictured myself outside of MIT too. I am a mathematician, which is the most spiritual profession: I am very comfortable with higher powers. I praise myself on great ability to think outside the box: it is mostly due to my claustrophobia. I am also a bit of a philosopher: I can go on talking about infinity forever. I would love to tell you a joke. I recently heard a good one about amnesia, but I forgot how it goes. My biggest problem is with English. So what if I don’t know what apocalypse means? It’s not the end of the world! We Are All Afraid to Die. I edited this 2018 puzzle and enjoyed it very much. Mass Aid. I didn’t work on this 2018 puzzle, but it looks like a lot of fun. Capital Punishment. 2017 puzzle that looks tempting. Typecasting. A 2017 puzzle with pictures of actors. Losers. A 2016 puzzle that I would be very bad at. Be a Star!. A 2015 puzzle that I enjoyed very much. Feeling Bluefin. A 2015 puzzle that looks delicious. Timbales. A 2011 puzzle that might be the most famous pun puzzle. Problem 1. Is it possible to put positive numbers at the vertices of a triangle so that the sum of two numbers at the ends of each side is equal to the length of the side? One might guess that the following numbers work: (a+b-c)/2, (b+c-a)/2 and (c+a-b)/2, where a, b, and c are the side lengths. But there exists a geometric solution: Construct the incircle. The tangent points divide each side into two segment, so that the lengths of the segments ending at the same vertex are the same. Assigning this length to the vertex solves the problem. Surprisingly, or not surprisingly, this solution gives the same answer as above. Problem 2. Prove that it is possible to assign a number to every edge of a tetrahedron so that the sum of the three numbers on the edges of every face is equal to the area of the face. The problem is under-constrained: there are six sides and four faces. There should be many solutions. But the solution for the first problem suggests a similar idea for the second problem: Construct the inscribed sphere. Connect a tangent point on each face to the three vertices on the same face. This way each face is divided into three triangles. Moreover, the lengths of the segments connecting the tangent points to a vertex are the same. Therefore, two triangles sharing the same edge are congruent and thus have the same area. Assigning this area to each edge solves the problem. There are many solutions to the second problem. I wonder if for each solution we can find a point on each face, so that the segments connecting these points to vertices divide the faces into three triangles in such a way that triangles sharing an edge are congruent. What would be a geometric meaning of these four points? I was on the writing team for the 2018 MIT Mystery Hunt. I am pleased that the hunt got very positive reviews from the participants. I spent tons of hours working on the hunt and it is good that folks liked it. I edited and tested a lot of puzzles. Here is my review of these year’s puzzles that are math-related. I already posted an essay about the puzzles I wrote myself. Four of my five puzzles are math-related, so I am including them below for completeness. I will mention the topic of each puzzle unless it is a spoiler. I start with Nikoli-type puzzles. Four elegant Nikoli-type puzzles were written or cowritten by Denis Auroux. In all of them the rules of the logic are stated at the beginning. That means the logic part doesn’t contain a mystery and can be solved directly. Good Fences Make Sad and Disgusted Neighbors (by Denis Auroux). You can guess by the title that this puzzle was in the emotions round corresponding to sadness and disgust. This is an interesting variation on the hexagonal Slitherlink. This is a relatively easy puzzle. Shoal Patrol (by Denis Auroux and James Douberley). Each grid is a combination of Battleship, Minesweeper, and a loop puzzle. These are difficult, but satisfying puzzles. The extraction step is not mathematical and not completely trivial. Submarine Patrol (by Denis Auroux and James Douberley). This is a 3D version of Shoal Patrol. Hashiwokakuro (Count your bridges) (by Denis Auroux). This is a mixture of Hashi and Kakuro. I enjoyed the puzzle while I tested it. The extraction is trivial. A Learning Path (by Tanya Khovanova and Xavid). This is a path logic puzzle that was targeted for new hunters. It contains self-referencing hints and solving techniques. There were several puzzles that were very mathematical. X Marks the Spot (by Zachary Chroman). A very non-trivial puzzle about triangle centers. Tournament Organization (by Scott Harvey-Arnold ). A tournament reconstruction puzzle. Cash Cab (by Erica Newman and Justin Melvin). Voter Fraud (By Ben Weissmann). A voting puzzle. The 10,000 Puzzle Tesseract (by Charles Steinhardt, Zachary Chroman, and Scott Harvey-Arnold ). The most difficult puzzle of the hunt, by far. Games Club (by Tanya Khovanova and Sergei Bernstein). This puzzle is about combinatorial two-player games. Murder at the Asylum (by Tanya Khovanova). This is a difficult puzzle about liars and truth-tellers. Studies in Two-Factor Authentication (by Brandon Avila). A very elegant puzzle, that is one of my favorites. There were also some math-related or computer-sciency puzzles. The Next Generation (by Colin Liotta). I enjoyed being an editor of this puzzle. Disorientation (by Alex Churchill). This puzzle has a beautiful visual component. Message in a Bottle (by Nathan Fung). The puzzle doesn’t look like it has something to do with mathematics, but my testing of it was very satisfying. I guessed from the start what it was about. Self-Referential Mania (by Justin Melvin). Self-referential logic puzzle, which I enjoyed editing. Bark Ode (by Elizabeth French, Justin Melvin, and Erica Newman). The pictures are so cute. Executive Relationship Commandments (by Robin Deits, John Toomey, and Michele Pratusevich). I didn’t see this puzzle until after the hunt. I wish I could have tested this puzzle with my son Alexey, who is a computer scientist. Word Search (by Tanya Khovanova). A crypto word search. Texts From Mom (by Elizabeth French and Justin Melvin ). A text enciphered with emojis. Marked Deck (by Colin Liotta and Leland Aldridge). One of my favorite puzzles. Hunters received a physucal deck of cards that was laser cut. You can buy the deck at Etsy. The art in this puzzle is beautiful, but the puzzle also has a non-trivial decryption step.